Adenium, or desert rose, is a succulent plant prized for the unusual shape of its thick, gnarled trunk with a bulbous for its base, and the showy blooms in shades of pure white, hot pink and vivid red. Although adenium can thrive in temperatures up to 90 degrees Fahrenheit, it won't tolerate extended periods below 40 degrees. If you live in a cold-weather climate, plant adenium in a container and bring it indoors for the winter. If you're adventurous, gather adenium seeds and start a bush from scratch. 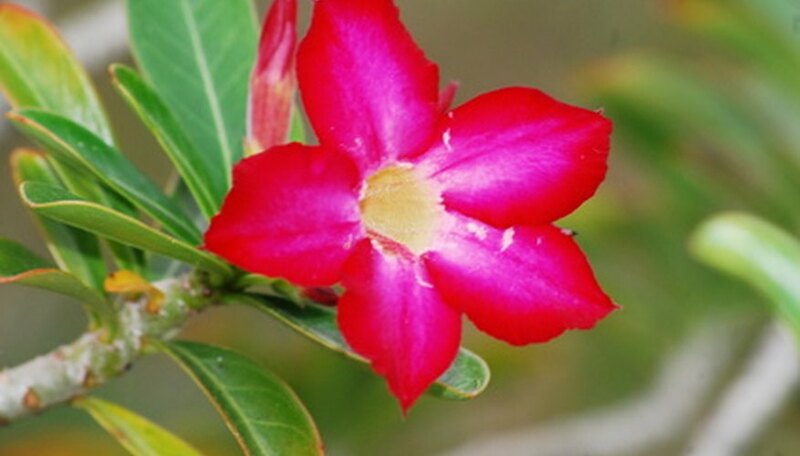 Wait for the adenium to finish blooming, and then locate a seed pod at the base of a wilted bloom. Wrap a piece of netting or a mesh bag around the plant and secure it with a rubber band. The netting will contain the seeds that will be expelled suddenly when the adenium's seed pod ripens. Remove the adenium seed pod from the plant when the seed has ripened and split open. Bring the seed pod indoors and empty the seeds onto a paper plate. The seeds will be tubular and will have fine hairs at each end. Use tweezers to pick out any debris such as bits of seed pod or stem, but don't worry about tiny bits of debris. Remove the hairs at the ends of the adenium seeds. Put the adenium seeds in white paper envelope. If you're harvesting more than one adenium, put the seeds in separate, labeled envelopes. Store the adenium seeds in a cool, dry place until you're ready to plant the seeds in spring.